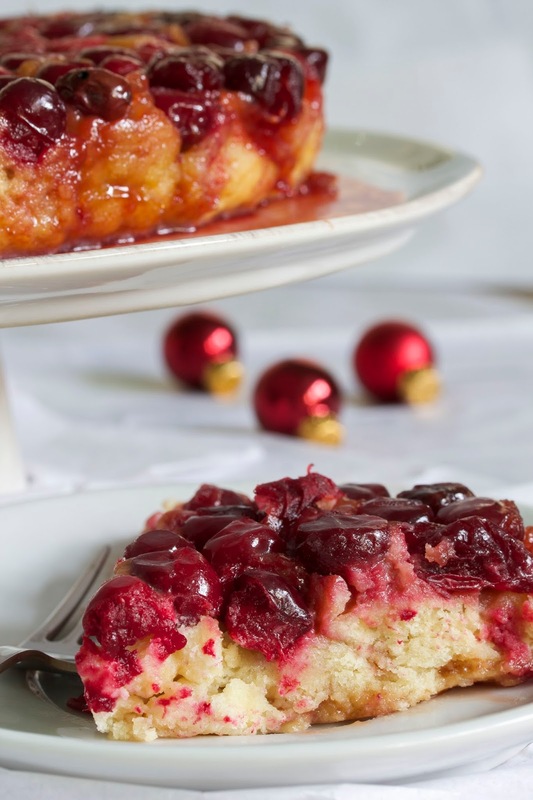 ’Tis the season for a Cranberry Upside Down Cake. This recipe uses coconut milk, minimizes the sugar, and adds lemon zest to allow the taste of the fruit to shine through. It looks beautiful on the table, and is a refreshing light dessert after a big meal. Once again, the Cup4Cup flour worked great. The pastry chef at The French Laundry restaurant started experimenting with gluten-free flours, and Thomas Keller, head chef, encouraged her to develop her own brand. It’s now available in stores and online. 1. Combine the cranberries and juice in a bowl. Set aside. 2. In a 9” cake pan, add the butter and brown sugar. Put in oven and keep a close watch until the sugar beings to caramelize, a couple of minutes. Remove from oven. 3. With a slotted spoon, add the cranberries to fill the bottom of the pan in a single layer. Pour the remaining juice over the berries, and set aside. 1. In a large bowl, sift together the flour, baking powder and salt. Set aside. 2. In a stand mixer, cream the butter and sugar until light and slightly fluffy. Add the vanilla, and then the egg yolks, one at a time, until all is mixed well. 3. Alternate adding the flour blend and coconut milk ending with the flour just until blended together. Put the batter in another bowl, and fold in the lemon zest with a rubber spatula. 4. Clean the mixing bowl and attachment. Beat the egg whites and cream of tartar until soft peaks form. Gently fold the whites into the batter. The mixture will be quite wet. 5. Spread the batter over the cranberries in the cake pan. Bake at 350 degrees F. until a wooden skewer comes out clean; check at 25 minutes. My cake took 40 minutes. 6. When done, place the cake pan on a rack and let cool for 15 minutes. Place a serving plate on top of the cake and turn it all over to allow cake to drop on the plate. Let cool down, and sprinkle the confectioner’s sugar on top through a sieve. The cake is best served warm. If desired, top with Coconut Whipped Cream, instructions here. Recipe adapted from Alice Water’s website here.